I would love to have a debate on this. There are all sorts of different interpretations, but basically this is the “mainstream” Libertarian platform. 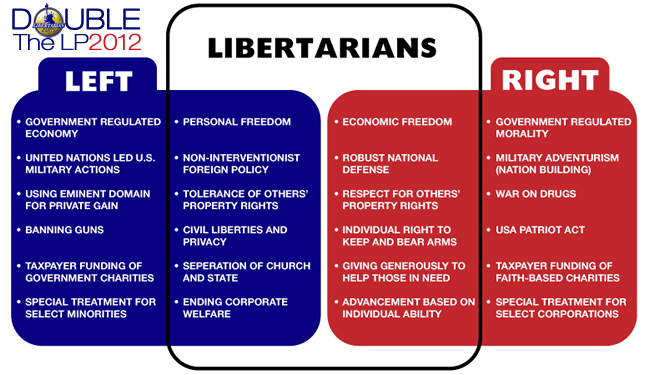 If you don’t fit fully into either of the two BIG parties… maybe you’re really a Libertarian. I would have gone with “Liberty Party” or “Constitutional Party” or something like that. But, Libertarianism is older than that so that term won. We just created a country out of it while other people were talking about it! Our Founding Fathers were Libertarian. They believed in it so much they sacrificed their lives to create a Libertarian country! Even those who didn’t perish sacrificed dearly. What else do you call spending 40 years of your life working for your country before family and self? George Washington, Thomas Jefferson, Benjamin Franklin, etc. All were great men. All were Libertarians. That’s just not true. It’s simply a matter of emphasis. I’m a military guy. Lemme show you what I mean. If you’re an Interventionist, you would be in favor of bombing Iran to take out their nuclear bomb factories. In that way, you stop them from nuking us. That is an OFFENSIVE foreign policy. A DEFENSIVE foreign policy would be using that same money you’re spending on bombers and invading foreign countries to station lots of missiles and fighters in the United States. Then, you can shoot down planes or missiles that are launched against our country. We would still have a few bombers and missiles to attack, but most of our weapons would be defensive. This has an advantage in that we aren’t guessing who to attack or spreading ourselves across the globe, in turn vulnerable to attack. We spend much of our budget on “force protection” which basically means guarding bases we have overseas. We don’t need a lot of guards for bases in the United States. Defensive also has the advantage in that if YOU are attacked FIRST, then you know exactly who to shoot back at. You are always justified in responding. Self defense is always allowable by all ethical, moral and international standards just like it is on a personal level. MOST of the Founding Fathers were actually Libertarians. Even the people that are hawkish on foreign wars have to admit that Washington, Jefferson and others were NOT in favor of going outside our country much if at all. Well, no but he also didn’t have anti-ballistic missiles (which were used quite successfully by us and Israel vs enemy missiles.) Nuclear weapons are just bigger versions of what we have. They explode more, but they are still bombs and missiles. If we have them too, and they reach the enemy just fine from the United States. The only things we deploy overseas are CONVENTIONAL weapons… bombs, rockets, etc. When was the last nuclear war we had? Yeah… shows our current nuclear system is working as a deterrent still. So, now we get to the “Terrorism” and “Biological Warfare” arguments. Sorry to say but YES, there was terrorism and biowarfare “way back when.” Anyone remember the Barbary Wars that President Jefferson fought vs Arab terrorists? They were actually pirates who were seizing our ships for ransom. And I’m sure you read about the blankets given to the Indians with Smallpox on them, or of Attila the Hun catapulting dead animals into cities to spread disease. No, that isn’t new either. In fact NONE of this is truly new nor can it ONLY be fought with troops stationed all over the globe. We don’t need to be everywhere and do everything. If it threatens US directly, then by all means attack. We pulverized Japan after Pearl Harbor. We socked Afghanistan back for 9/11. That’s entirely justified. That didn’t happen because of POLITICS…. and our President wanting to “rebuild” the Middle East in his own imagination. He, like President Bush before him is not about defense. He’s about REGIME CHANGE. That’s where the Democrats and Republicans seem to agree. They are both pushing for REGIME CHANGE and overthrowing foreign governments. It’s not about fighting terrorism, it’s about playing “God” and restructuring things the way you THINK they should be. That is what is costing us so much money and lives. Not defending America. Not a strong national defense. If anything, being stretched too thin means we are WEAKER AT HOME. Hurricane Katrina hit when I was in Iraq. With us were the National Guard guys from Louisiana. They weren’t too happy about sitting in Iraq when their homes were demolished by a hurricane. Do you think maybe it might have helped having the National Guard home when the hurricane hit? can’t be in two places at once. We are weakening our own defenses by overextending ourselves. That’s not “weak on defense” in my book. It’s just common sense. In fact, that’s what most of the Libertarian platform is. Common sense. The kind our Founding Fathers had. The kind that doesn’t get “obsolete” with time. It’s based on people and how they act. If people haven’t changed in thousands of years… how can the rules for freedom, liberty and justice have changed? And now, to those who have given up on “the system.” This is your chance to make an actual difference. There ARE other people who think like you do out there. A LOT of us. Tired of the old way of doing things, and wanting to get back to…well… the OLDER way of doings things I guess. If you do NOTHING then you are silently agreeing to the way things are going. Do you LIKE how things are going? Your silence is your agreement. If you don’t agree, then try something different. The worst that can happen is nothing…which is what you were doing before. Only this time you have a clear conscience because you TRIED to do something for your country. In all likelihood, even a loss is a win in this situation. “Losing” but getting a few percent of the vote, even 5%, is enough to make the Libertarian Party “official” on the ballot for a couple elections. That’s significant. Simply by standing up for your beliefs and getting that much support, it will scare the bejeezus out of the Republicans and Democrats. They will scramble to try to win back your vote. If you didn’t even vote before, now you DO have a voice! Those who don’t vote are “bonus” votes. You aren’t in their “camp” so to speak or brainwashed. You are “fresh blood” that they will fall over themselves to try for. It’s like that bank commercial… who doesn’t want them coming to try to find you? Think about it. Especially if you’re in an area that is solidly one party. New York is a fine example. As a state we’re so Democrat Blue the Smurfs are jealous. But, upstate is heavily Republican Red. There are just so many people in NYC that they win every time. In this case, BOTH parties are ripe for a Third Party. For the Republicans, If you know you’re gonna lose the election, what do have to lose by giving a third party a shot? You already lost. For the Democrats, if your party is just ASSUMING you’ll vote for them (even if they’re corrupt as hell like they are here) then why not wake them up? “Your party” will win anyway, even without a few votes. However, you’ll send them a message that you can’t be taken for granted. For both types of voters, it’s a “win” if you can reach just 5%. That’s where the magic starts. That’s when people realize there IS another option and they two monolithic parties are forced to change their ways. Or, you can keep supporting the status quo. Voting for them, or not voting…. doesn’t matter. Either way you’re STILL supporting them and the status quo. Or you can make a difference and vote like our Founding Fathers. After all, that’s what being for Freedom and Liberty is all about. If you’re not sure, I also included the “World’s Smallest Political Quiz” to see where you fit on the Political Beliefs Spectrum.